On May 14th, at Central Park’s activities center, San Mateo will host a meeting and vigil for religious freedom for all. The inspiration of the day is that it is the 3rd anniversary of the arrest of six of the Yaran. We have sent letters to all the churches and religious orgs in San Mateo & surrounding areas. We invite the Friends to come joins us. The meeting is from 7-9 PM, light refreshments. Please contact us for further details. We will have an open sharing time for prayers and remarks. Recently a junior youth group in the Central San Mateo neighborhood was hanging out and they noticed some friends of theirs and their mother were about to wash their car with a couple rags and a small bucket. It would’ve taken them a long time this way! The group saw an opportunity to serve and got some hoses, rags and towels to help out their family with this task. Car washing goes much faster with 7 of them! It was a hot day so the cool water felt really nice. It also felt really nice to stumble into a small little service project involving our neighbors. The car looked really nice once we were all done. It even had the effect of beautifying the neighborhood. They look forwarding to stumbling into more service projects in the future. 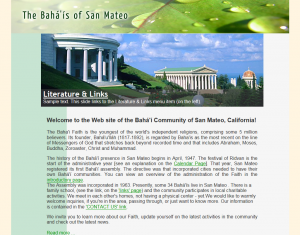 The Bahai’s of San Mateo have recently launched a new WordPress-based website. We hope to be able to post new articles about what’s happening in the community periodically.